There has been a bit quiet on the ATP pro player racquet front of late, but the off-season is a period of testing new things and Novak Djokovic is trying a new blacked-out HEAD racquet. 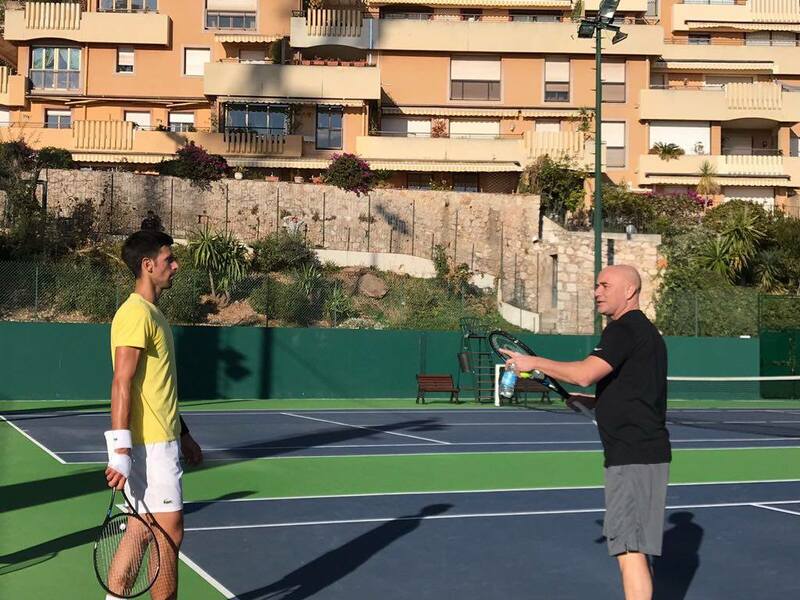 Novak Djokovic will make a highly anticipated comeback after six months away from the ATP world tour and right now he’s practicing in Monte Carlo together with his coach Andre Agassi. Pictures reveal that Djokovic is actually trying out a new racquet with a 18×19 string pattern, which makes you wonder if it is based on the new HEAD Graphene Touch Prestige Tour. As most racquetholics know, Andre Agassi used to play with a 18×19 string pattern in his HEAD Radical Oversize racquets and maybe he has nudged Novak to try something new? Djokovic’s lead tape placement also looks slightly different than his usual specs (read this post about Novak Djokovic’s racquet) as he has placed long strips of lead at 3 and 9. This might be nothing more than just trying out a new racquet. Last year Rafael Nadal did the same with the HEAD MxG mold and he ended up sticking to his old racquet – the Babolat Aero Pro Drive Original (read more about Rafael Nadal’s racquet here). If Djokovic will stick to his new racquet is hard to say, but I would doubt it. If it is a HEAD Graphene Touch Prestige Tour he’s trying, maybe it’s an attempt to get him to play with a commercial racquet model that you can buy in the store instead of his rare pro stock mold PT131B. What do you think of Djokovic experimenting with a new racquet and do you think he will make a great comeback to the tour? Please comment below. Could be the new Prestige Tour 99. Lead at 3 and 9 is moved up actually and there is lead at the top of the inner hoop. Agassi is a gearhead and was always more experimental with his racquets than other pros. Head sent him pro stocks to tinker with is my guess.